Special Offer. Buy 6 Bottles for £27.50 each. Single Bottle Price - £29.50. A bright yellow colour. A shimmering wine with an abundance of tiny bubbles. Fruity nose dominated by the presence of the Chardonnay grape. Full of finesse and elegance. Mirabelle plum notes and bush peach. The initial impact is fresh and structured. Perfect balance. The strength of the Pinot grape comes through on the palate, with red fruits and honey. The finish is long and powerful. Starters and fish. Its definite nose and unassuming vinosity will form a tasty combination with a meat pie, langoustine salad or grilled red mullet. 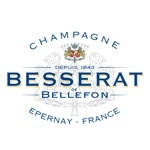 Besserat de Bellefon was founded in 1843 in Ay by Edouard Besserat. A native of Hautvillers, he applied his craftsmanship and skill to creating wines which he distributed to leading hotels, restaurants and purveyors of fine wines. Following Edouard the family continued his legacy. His grandsons Victor and Edmond inherited his passion for perfection and his sense of excellence and high standards. One was an unrivalled winemaker, the other an outstanding wine taster and they worked tirelessly and in complete harmony to increase the renown and image of their House. 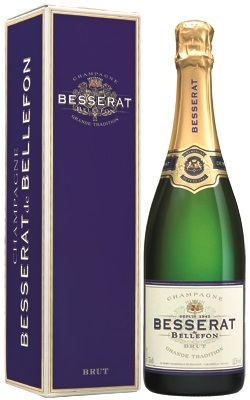 1930 marked a historic turning point for Besserat de Bellefon with the creation of a lightly sparkling champagne that could be drunk throughout a meal. This was the birth of the range known today as Cuvée des Moines (Cuvee of the Monks).